The Hibernate One-To-One Mapping Example using Foreign key Annotation tutorial shows you how to use Hibernate One-To-One Unidirectional Foreign Key association mapping using annotation based configuration. Here, one table has a foreign key column that references the primary key of associated table. We are taking an example of Student and Address relationship. This relationship said that a student lives on one Address and one address can be occupied by only one student. Noticed that STUDENT table contains a foreign key (here is address_id field) referring to a primary key (here is id field) of ADDRESS table. 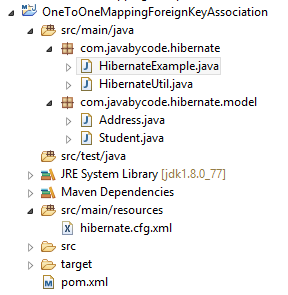 In this Hibernate One-To-One Mapping Example using Foreign key Annotation tutorial, we will create java project with final directory structure. Model class Student and Address are simple POJO class. Here we are using class Student and Address with JPA annotations to map them to a database tables (these tables were created in above step). @OneToOne on address field of Student class indicates that there is a one-to-one association from Student to Address. We are using @JoinColumn annotation which maps on a seperate column ADDRESS_ID in STUDENT table. Here, You don’t still see the constraint between Student entity and Address entity, do you? Let’s look back the table creation step, you will see the foreign key between Student and ADDRESS table. Thanks to this constraint, the @JoinColumn also point to primary key of ADDRESS table. As discussed above, STUDENT table contains the foreign key referring to a primary key of ADDRESS table. So that we have to persisted address entity firstly then we set student’s address property and persist student. That’s it on the Hibernate One-To-One Mapping Example using Foreign key Annotation.